The Half Rack is a smaller version of the original POWER Rack. Now even space conscious consumers ca.. When it comes to power rack essentials, the Legend Fitness 3121 Power Rack is definitely the Esse.. 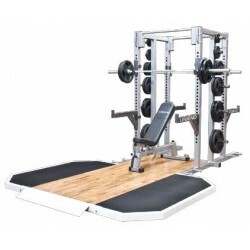 The ideal in powerful strength development while maximizing floor space, the Legend 3227 Double-S.. Revisions to this weight room staple make the Legend 3195 8x8 Hardwood Lifting Platform is the lo..
3x3 ﻿11 gauge steel and 3/4" hardware makes this an incredibly solid rack with modular function.. Revisions to this weight room staple make the Legend 3194-R All Rubber Lifting Platform is the lo.. Incorporating the same design advantages as the 3263 Modular Power Cage, the 3264 Modular Half Ca.. Revisions to this weight room staple make the Legend 3194 Hardwood Lifting Platform is the longes.. The American Barbell Squat Stand is a staple for any garage gym, Affiliate or school training center.. This imposing piece of equipment towers over the weight room. The Legend Fitness 3221-8 Pro Serie.. Revisions to this weight room staple make the Legend 3195-R All Rubber 8x8 Lifting Platform the l.. The perfect training tool for any serious training, any exercise can be done safely and effective..
Versatile" is a word that we use a lot to describe our products, and in this case it's especially.. The larger of our two independent lifting platforms featuring the beautiful yet very durable lami..